In February 2017, Patrick Quinn made a presentation to the Lebanon Community School District Board requesting that the Pioneer School Library be named in honor of Sergeant First Class Scot R. Noss. 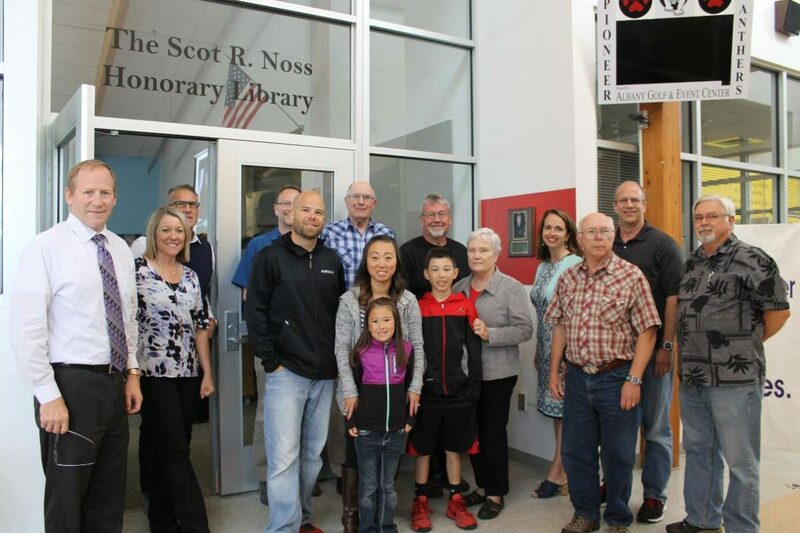 On June 8, 2017 the public, District officials and the Noss family gathered to formally dedicate the Scot R. Noss Honorary Library. Scot Noss was born and raised in Lebanon, and graduated from Lebanon High School. Scot always wanted to serve in the Army, like his father, but specifically as an elite Army Ranger. Scot enlisted at age 21, and served for several years, including eight deployments. While on his eighth deployment in 2007, a Chinook helicopter returning Scot’s group from a mission experienced engine failure and crashed. Eight personnel were killed and fourteen injured. Scot suffered a severe traumatic brain injury, but because of his Warrior spirit and the skillful treatment of the medical crews that worked on him throughout his evacuation chain, Scot survived this devastating injury though it left him in a minimally conscious state. Scot has received several military awards, including the Bronze Star, Meritorious Service Medal, Combat Infantryman’s Badge, FBI Award for Hostage Negotiation and Rescue, and the Order of Saint Maurice from the National Infantry Association. Patrick Quinn asked that the Pioneer School Library be named in honor of Scot due to the special significance this specific library held to the Noss family. Scot’s favorite place at school growing up was the library, and he was a fervent reader. His mother, Nelda Noss, taught in the Lebanon School District for many years, including at Pioneer School, and his brother, Ryan Noss, was also principal at Pioneer School during his own career with the District. As neighbors to the Oregon Veteran’s Home, the staff and students at Pioneer School have an ongoing relationship with local veterans and participate in several veteran support events, making their library an even more meaningful choice to be named in honor of Scot. A plaque and photo of Scot now hang next to the library entrance, and the window above the door proudly states it is the Scot R. Noss Honorary Library. A scrapbook of Scot’s accomplishments and life of service to his country is available in the library, along with a second scrapbook which will travel between other school libraries within the District, so that all students may know of this dedicated soldier and his accomplishments.